Last weekend, like many weekend mornings, my running buddies and I laced up our running shoes and hit the trails. The mission: 10 miles. Just so you know, for me, a 10-mile run is challenging. Very challenging. As is typical with long runs, the muscle pain and fatigue hit me last weekend just after the 6-mile mark. So you can imagine my delight when we encountered an incredibly steep hill right around mile 7. We were close enough to our turn around point that we could have skipped the hill and made up the mileage on the other end of the run. But one of my running buddies and I decided to conquer the hill! Most races include at least one hill, so we thought it would be good practice. As we reached the base of the hill, we realized what we had gotten ourselves into. The hill was very steep and very long. We second-guessed our decision, but decided to keep on going. My conclusion? When you conquer something challenging, like a hill, or a mountain of clutter, the very worst place to be is at the bottom looking up at what lies ahead of you. It can make you feel like stopping or turning around. But, when you conquer the challenge ahead, you feel an incredible surge of energy—a second wind that will fuel you for the rest of your project. In my case, this was the rest of my run. As counter intuitive as it seems, your second wind—your motivation to finish that project—starts right at the top of that very first hill. So what’s your hill? Is it a pile of clutter? Your over-flowing closet? Or is it some sort of important goal that feels too big to even start? Why not take that first step today, with the faith that your second wind is out there waiting for you. Thanks Aby – this makes me feel better about my challenge to tackle a basement full of boxes. I’m hoping that once I was good and ready and plenty determined, the daunting feeling would go away. I’ll keep your inspirational words in mind! Thank you Jackie! Good luck with your basement. Here’s another thought to keep in mind: Take action and the motivation will follow. Wow, seriously inspirational–thanks! I love this metaphor. It’s a great way to think about tough tasks, whether I’m facing literal or figurative mountains that need to be climbed. Thank you Aby. This last year I have been avoiding so many things that need to be organized because I have been adjusting to being my mother’s primary caregiver. Now that I’ve settled into some sort of routine I’m going to tackle my closet and dresser that are both full of clothes that need to be gotten rid of. I’m sorry to hear you’re mother isn’t doing well. Being her primary caregiver is a lot to take on. I’m so glad I’ve inspired you to tackle organizing your clothes. Good luck!! Wow! Go, Abby!!! You are truly an inspiration, and I will try to also, get my second wind as far as organizing. Very proud of you and you are are a great person, and glad to have been lucky enough to find your workshops and inspiration online!! Go GIRL! Thank you Linda! I’m so glad to hear you’re my classes! This is just what I needed this morning! I’ve become discouraged in my job search, not landing several jobs that I interviewed for. Sometimes I feel like giving up. Your positive attitude gives me the little push that I need right now! I totally agree with this. When we first started decluttering, it was hard to get started. Once we started and could see some progress, it got much easier to keep going. I love the picture too, so true. Thanks, Eric! 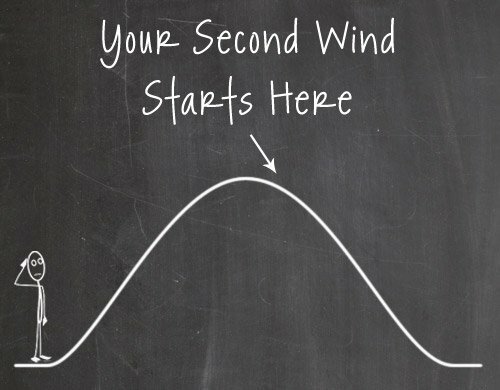 Glad to hear you found your second wind while decluttering! Getting started really is the hardest part. Hang in there Catherine. The right job will come along! And I hope soon. Don’t give up.